Kyr’shin Yilenzo, Everyman Gaming’s iconic Kitsune Cavalier / Fighter. Includes a detailed character gazetteer, featuring Kyr’shin’s vital statistics and character history. A full, easy-to-reference 20-level character build for Kyr’shin Yilenzo including full information on his classes (cavalier/fighter), archetypes (gendarme, honor guard, lore warden, martial master), feats, character traits, stamina and tricks, and mount (an allosaurus named Tsume). Seven stat blocks designed to allow GMs to use Kyr’shin Yilenzo as an NPC in their campaigns. Includes stats for Kyr’shin at 1st, 3rd, 7th, 10th, 13th, 17th, and 20th levels, as well as helpful information to quickly rebuild Kyr’shin as a human character on the fly. Three pregenerated character sheets that allow GMs to hand a 1st, 3rd, or 7th-level version of Kyr’shin to a player for quickly playing the Everyman Iconic as a PC on the fly. With Everyman Gaming, innovation is never more than a purchase away! The first installment of the Everyman Iconics-series clocks in at 26 pages, 1 page front cover, 1 page editorial, 5 pages of SRD, leaving us with 19 pages of content, so let's take a look! Okay, so this book, basically, is an NPC-book...or a pregen-book...or a build-scavenge-book...all depending on what you're looking for. 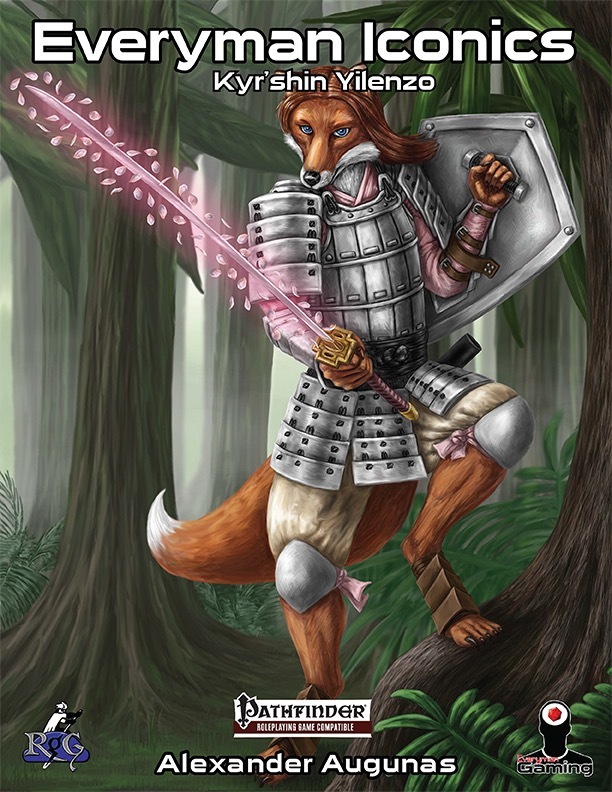 let me elaborate: This book takes the very first of Alexander Augunas' by now notorious kitsune characters, pretty much the face of Everyman Gaming, Kyr'shin Yilenzo and provides the build options for the character in an easy to grasp manner. 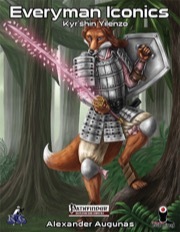 The pdf begins with an extensive fluffy background that renders the stats a proper character - with extensive description and background, the section also provides a personalized code of conduct by which Kyr'shin acts alongside detailed information on the kitsune's personality. This is Everyman Gaming, however, so we do not simply get a smattering of statblocks thrown out way - instead, we get reprints of the respective archetypes utilized, which, this time around, would be the Gendarme, Honor Guard, Lore Warden and Martial Master-archetypes - correct, ladies and gentlemen - a total of 4 archetypes. Beyond that, Kyr'shin uses the order of dazzling lotus and his racial stats, feats and even traits have been reproduced within these pages. The build is not restricted to core, however - instead, the book utilizes the absolutely glorious Antagonize-mechanic used in the superb Ultimate Charisma book (which is pretty much a must-buy for PFRPG!) as well as his list of combat tricks powered via Combat Stamina, making concise use of Pathfinder Unchained's stamina rules. And before you ask - yes, these rules have been reprinted for your convenience in this book. Kyr'shin Yilenzo begins play as a kitsune cavalier with both the gendarme and honor guard archetypes and thus, he gets a mount. An allosaurus. Yep. The kitsune riding the dino. Neat! The character receives multiple follow-up builds, with the first being a CR 2 iteration that adds a cavalier level and the dual-archetyped fighter level into the fray. And yes, the statblocks are accompanied by the respective mount statblocks as well. The subsequent builds cover CR 6, 9, 13, 16 and 19...oh, and just fyi: Base mount stats for other characters riding an allosaurus are included...and the mount's feats are covered as well. Then, the pdf suddenly switches layout from 2-column portrait to 3-column landscape - for a reason: The level 1, level 3 and level 7 iterations of the kitsune are provided in this format - easily printable on one page - and yep, these guys are basically the pregen-versions of Kyr'shin. Pretty awesome, just fyi: A handy, massive table shows kyr'shin's default progression regarding levels/multiclassing, with save-progression, advancements and special abilities gained all codified in one handy table. Editing and formatting are excellent, I noticed no significant glitches. Layout adheres to a relatively printer-friendly two-column full-color standard with great full-color artworks. The pdf comes fully bookmarked for your convenience. Alexander Augunas' Kyr'shin is a great character -an evocative, cool champion that is pretty fearsome as far as his combat capabilities are concerned. Unlike many a martial pregen/NPC, Kyr'shin has quite an array of unique tricks he can pull off, rendering the playing experience of the character very smooth. The attention to detail and handy explanations of material utilized herein also restricts the necessity to look anything up to a bare minimum, which is a HUGE plus in book. All in all, this guy represents a great, evocative NPC to introduce to your campaign, a great first taste of the cool material in Ultimate Charisma and an all-out well-made NPC. I enjoyed Kyr'shin and consider him to be a neat addition to the game - and what more could you ask from regarding an NPC-book? Precisely. My final verdict will clock in at an unsurprising 5 stars + seal of approval. Also, I'm happy to introduce Paizo's own Jeff Strand as our Cover Artist for the Everyman Iconics series. If you see a crazy-detailed picture that looks like someone painstakingly sat in front of a canvas with an oil brush and pants for a month on an Everyman Gaming product, you're looking at one of Jeff Strand's pieces. Just spotted this announcement. I keep an eye out for Liz Courts' posts like this. This looks like a cool product and the price point is right for my budget. Looking forward to checking it out. Thanks for the review, End! I'm thrilled that you enjoyed it; I wasn't sure how this would be received on account of no other company having a product line like Everyman Iconics.